And it came to pass that the pianist spent part of her day celebrating (sight-plowing) her way through Britten's Ceremony of Carols. (The piano is not a harp. The piano is not a harp. Conductors, will you ever learn?) A quirky mix of the spiritual and the mystical, the piece is also appropriately expectant. Go--now--and listen. It is simultaneously old and new in the ears, a poignant juxtaposition of gospel and testament, modal modulations and sometimes unexpected rhythmic designs. Britten acknowledges the past but leaves us gazing, expectantly, towards ages ahead, to the next and future acts and scenes. Best birthday song ever! Today, in the wings turns one! "Also please send a repertoire list." Oh. Of course. But damn. Many pianists, particularly those inclined towards contemporary music, place these prim lists on their web sites out of professional necessity, yet few remark on the pieces they've chosen to include. (And certainly everyone is choosy.) Wouldn't the annotated rep list make for scintillating reading? Every performance, from triumphant recital to disastrous premiere, formal master class to maudlin new music festival, usually has a great story at its heart, but rep lists are rarely so colorful. (That's why we write blogs, I guess.) Clean written-out rows suggest a pianist's aesthetics but only hint at the artistic journey: the performance has been weeded out. At least in web format, these alphabetized, itemized, and categorized lists can offer information to both the curious layperson and competitive professional. Hmm, what is a shofar? Or maybe, He's playing Scelsi?! [picking up telephone and dialing a number] "Hello? I'd like to place an order for a piano score..."
I've been tending my own list. It is a work in progress. The northwest corner of the new de Young Museum twists skyward, as if it’s been pinched between an oversized thumb and forefinger and given a good tug. Maybe Jack’s giant wanted the museum back but—wary of the San Franciscan—decided against it and let go. And so, with nowhere to hide, the tower remains, revealing and concealing vague internal movements under its mesh-like copper exterior. It takes a few moments to realize that the shimmer is created by people on the ninth floor observation deck. The lively movement plays down the tower’s looming presence and beckons those who enter the museum proper to climb on up for the fairytale view. “We’ve been waiting five years for this!” She speaks passionately, defiantly, while smoothing her shirt over her belly, and I laugh to think how these months of waiting for her first baby are nothing compared to the wait she endured for the return of her favorite urban respite. As Julie and I stroll through the de Young’s new exhibits and familiar collections, she tells me stories about being pregnant. “The baby’s always moving. Well, except when I’m moving. Then it’s still. But when I’m still, it’s crazy, all dancing and jumping! I can feel all that movement…if I’m still.” We stop in front of a painting but her observations continue to roll around in my head. A theme is born: holding art still, a museum invites still observations, yet a well-designed floor plan creates movement, a necessary counterpoint to all the stillness. So what is the function of the physical structure of an art museum, and what are the effects of being contained within it? Moving through the de Young does not necessarily allow for a complete easy survey of the collections, but that’s ok. Though basically rectangular, the floor plan is divided from a perfect axis into long, trapezoidal galleys, and the passageways that convey onlookers from room to room delineate the museum’s angularity but encourage a natural pace, from contemporary art to Oceanic sculpture, colonial American painting to Mesoamerican artifacts. The main staircase, though placed strategically near the center of the building, feels like it’s in the place you’d least expect, and it turns the museum into a cleanly beveled Mobius strip. Upstairs, then downstairs, from one culture to another, the planes of polished eucalyptus yield to infinite wanderings. Chairs, though, insist that we try being still. From the pyramid-like perches on which to sit and gaze at John Singer Sargent’s society women, to an unidentified row of brocade, oak and tassel in an upstairs hallway, to the oversized fallen apples scattered in the sculpture garden, the reminder to sit in stillness echoes throughout the museum. Even when tipped and toppled as in Catherine Wagner's quirky photographs, the chair suggests repose. And the point is solidified, literally, when one enters the contemporary art gallery. Here, a common oak chair is trapped in a cement block (presumably some chunk of a house’s foundation) and viciously impaled by rebar, an impossible yet entirely plausible cross-section that succeeds in transforming our typical indifference toward the everyday object into an act of serious contemplation. My interest in the physical structure of the building, and its effect on my aesthetic experience, allows me to shrug off some of the jarring idiosyncrasies of the de Young collection, most notably the pre-twentieth century American paintings. The polite pilgrim children interrupt my harmonious meanderings. What to make of a room full of staid American landscapes in gaudy gilded frames? Perhaps it will take a return visit or two to make sense of the unexpected juxtapositions and to appreciate the dialogue between the still and the moving…between the structure and the self. So much of making music is a private endeavor. The San Francisco Contemporary Players inaugurated their season Monday night with a program that reminded their audience of this fact. The concert consisted of works for solo percussion and solo piano (performed by Dan Kennedy and Chryssie Nanou, respectively) as well as Salvatore Sciarrino's Infinito Nero (scored for an expanded Pierrot ensemble) and demonstrated the group's high level of musicianship. The listener, however, was held an arm's length away from full musical engagement. Each performance reminded me of watching a mechanical holiday window dressing, where fantastic scenes play out with magical perfection and precision but never manage to breach the pane of glass that separates the viewer from the viewed: participation in the ensemble of private activities is longed for but must be imagined from a distance. Mei-Fang Lin's Multiplication Virtuelle for percussion and electronics established the peculiar tone for the evening. Kennedy moved from one percussion set-up to another "like a practitioner of tai chi," and he played with an admirable assuredness. But just as an onlooker can not reap the physical and mental benefits of tai chi by watching a few gracefully executed movements, neither can a listener fully comprehend and appreciate the musical intention without some sort of real, visceral immersion in the aural world. Structurally, the piece lacks development; it is a straightforward progression from one instrumental group to another that, after a while, begins to sound like a series of exercises. Multiplication Virtuelle contains some lovely moments, particularly in the spontaneously processed electronic sounds and the jazzy plucking of the Lion's Roar, but falls short of adding up to a satisfying, integrated whole. The performance seemed to be a fulfilling experience for the percussionist but was less so for the audience. Chryssie Nanou's performance of Sciarrino's "Piano Sonata IV" maintained the feeling of a private practice made inadvertently public. The piece is an ambitious physical exercise for the player, who leaps relentlessly from one end of the keyboard to the other as if channeling the strengths of a virtuoso stride pianist gone mad. Nanou could have delivered the piece with more comedy, with more wry flair for the drama that seems inherent in the score. Instead, I felt as though I were observing her through a practice room window, watching her begin her day with a vigorous warm-up routine. Rather than "tending" to technical matters, a pianist needs to approach the piece with as much recklessness as precision, not to mention some flamboyant dynamic shaping. In this way, for the pianist as well as for listener, Sciarrino's musical lunacy becomes inescapable. The Contemporary Players want their audiences to "listen to modern art," and they incorporate the visual art concept into other aspects of their programming, but framing music in this metaphor takes a rather cool, abstract approach to what should be a more fun and engaging experience--on both sides of the podium! Sciarrino's Infinito Nero, for example, walked the fine line between "private" music and publicized performance. With its fragmented juxtaposition of silence and quiet unmusical sounds, the piece has the potential to turn the listener into a Peeping Tom. Yet in one of the most expressive moments of the evening, percussionist William Winant broke through the glass with a series of superbly measured decrescendos on the bass drum. Winant teased a simple chain of quarter notes into a visceral musical idea, and suddenly, I was no longer a mere observer but a vicarious participant. The fading footfalls--POM, POm, Pom, pom--became my own, and I was more or less immersed in the piece, in the mezzo-soprano's startling vocal outbursts and the wind instruments' punctuating breaths and gasps. If anything, the performance of modern music needs to offer more than a museum quality presentation. The Players are clearly and willfully engaged; as a listener, I want to feel that I, too, am in the musical trenches with them. Enough of the private performance, give the listener the "hook" of intimate participation--after all, who really wants to look in from the outside? Wilhelm Müller wrote the Winterreise poems when he was 30. He died three years later, in 1827. In 1827, at age 30, Franz Schubert composed Winterreise. Hans Hotter first recorded the songs at age 34 (in 1943). In 1943, at age 17, Dietrich Fischer-Dieskau gave his first public performance. Five years later, he recorded the songs for the first time. Fischer-Dieskau championed the songs throughout his career, recording them close to a dozen times. Now 80, he acknowledges "the young Hotter" as a personal favorite. Among the more contemporary performers, Matthias Goerne tackled Winterreise when he, too, was barely 30. Is eighteen too young? Was I too young, at eighteen, to hear Winterreise for the first time? It is a bitter and emotionally barren journey, a cold, solitary walk and a hopeless obsession over a love--a life--gone awry. This is no leisurely Sunday loop through the hills but a final trek, resignedly one-way. Schubert's setting of Wilhelm Müller's poetry is impossibly wise beyond its years, too knowing for one who has just begun a wildly impetuous first semester at college. And at the time, my experience of German lieder bordered on the virginal. At the concert, a professor nervously asked me about the translations she had madly typed and photo-copied at the last minute: had I read them, were there any glaring errors, could I follow the texts and still enjoy the singing? Rather dumbly, or simply, I said, "Oh, I didn't even look at the translations. Do I need to? I can understand every word he is singing." The professor seemed surprised, "I had no idea you spoke German!" I do not, but that singer performed a story that needed no translation. For a few hours, I felt that I'd always known German. Ah, eighteen. I blame it on eighteen that I can not for the life of me summon up that baritone's name, even if he remains one of my highest ranking musical memories. He held my hand, with sincerity, and escorted me directly into the musical and poetic world. I felt the snowflakes, the icy chill, and the heaviness of a broken heart. I dreamed nostalgically when we stopped at the linden tree, and though I wanted to run away from the hurdy-gurdy man, I followed his mesmerizing tune towards the inevitable. To extend this sort of tag-along invitation is risky: many performers, driven by ill-conceived motives, would come across as pandering. But that baritone...that Winterreise...well, he was pretty special. I quickly learned not to compare other performances to one unforgettable afternoon in Smith Auditorium. Last week, however, Asha Bhosle contested that memory. On their most recent release, You've Stolen My Heart, Kronos Quartet teams up with Asha Bhosle for a fun romp through Bollywood. The performance at Yerba Buena, not surprisingly, was a far cry from the formality of a German art song recital: Bhosle and first violinist David Harrington constantly "broke character" and provided some casual commentary, with Asha half-heartedly worrying about the "difficulty" of each successive song and Harrington almost beside himself with boyish admiration. When she began to sing, however, Bhosle dropped all of her self-effacing pretense. She owns those songs and is still fearless enough to get right up on top of her vocal chords, to an uncomfortable place (by western classical music standards) that equals the raw emotion she pours into the music. Her fierce intensity, combined with the ease and fluidity of her performance (she has sung these tunes for decades, after all), is what steals hearts. Just as I followed the baritone through Schubert's chilly landscape, I joined Asha in a (much warmer!) haze of smoke and sensuality. Do I know a word of Hindi? No, but I could easily groove along to the nostalgic hippie spirit of Dum Maro Dum and Light a Match. Transforming innocence into experience (whether of Bollywood, a poetic nineteenth-century winterreise, or the rue Fürstenburg) often depends not so much on a pitch-perfect musical performance but on a performance that is an open invitation into the musical world. The perfomers in these two situations delighted in showing me--sharing with me--the musical terrain. Now, I do not necessarily expect the full personal treatment at every concert I attend: if that happened, it would cease to be special, and in some circumstances might even seem inappropriate. In an ensemble, for example, too many individual invitations could undermine the whole of the performance. But memorably, and in their own distinct ways, the nameless baritone and Asha Bhosle both managed to steal my heart. Oppenheimer liked to float above the rest of humanity, not just intellectually but geographically. If you go to see the places where he lived, you notice that he made a habit of perching like an eagle on the rim of the world. When he lived in Berkeley, he took a house high in the hills; it had the address No. 1, Eagle Hill. In New Mexico, he had a cabin on Grass Mountain, a surreally lush meadow at nearly ten thousand feet. And so I couldn't help wondering: if Oppenheimer had attended the opera--his opera--tonight, would he have sat way, way up in the balcony with the likes of moi? Seat J127? And when I wake, I'll swim a mile for women with cancer. 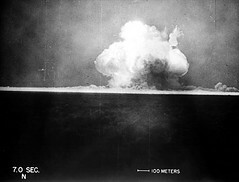 Several hours later, I'll put on a pretty dress, powder my nose, and head into the city for the premiere of Dr. Atomic. What should I make of this eerie intersection, if anything?